I went to the Hendon Residents Forum yesterday which was chaired by Hale Councillor Brian Gordon. It was a good humoured and good natured event and Cllr Gordon was very fair in letting everyone have their say, including those who wanted to criticise the council. Compare this to the actions of some councillors who go out of their way to stifle opposition and dissent. The way to win an argument is to allow that argument to take place. One local resident talked about a very serious personal issue which was causing her some distress. It was clear that Cllr Gordon’s concern for her welfare was absolutely genuine and heartfelt, when he could have simply made excuses and passed the buck onto a junior officer. 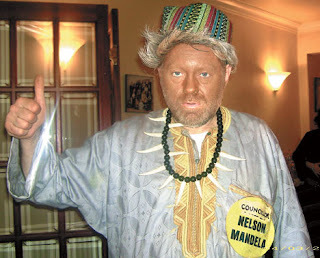 Last year Brian Gordon got into hot water when he dressed up as Nelson Mandela for a Purim party. The fuss it caused at the time was utterly ridiculous and I wrote to the papers supporting him, pointing out that Harry Enfield performed a Nelson Mandela routine and nobody complained about that. Rory Bremner does a very good Trevor McDonald! There will soon be a vacancy for leader of the council. Do we want a failed businesswoman taking over or someone who cares for residents, who understands that there are two sides to a story and shows signs of actually being a real human being? I know who I would vote for, not that we are allowed to choose our leaders in Barnet. How pathetic Dave, I thought even you would have risen about petty comments about former colleagues! Would you like to try posting your message again in English? I am paying a Conservative councillor a compliment for a job very well done. What exactly is your problem with that? Don't Call Me Dave was paying a hearty compliment to an excellent Chairman of the Hendon Residents' Forum. Is he not allowed to do that? Compared to the ill-trained and clock watching Chairman in Chipping Barnet, his approach is hugely refreshing. Whereas experienced Councillor Gordon clearly takes an interest in his role and is hard working, in Chipping Barnet the Chairman has attacked residents at the meeting and refused people their right to express their views. Hopefully the Conservative Group can excercise greater care in their choice in future. Sure, that's right crackhead, I think others are giving you a bit too much credit when you pipe out with odd comments like that. Clearly you don't know much at all. See if Mike Freer would like a comment like through on his Council Tax funded blog. Dear me Dan, get a job and then a life and let everyone else get on with what they are paid to do. Jealousy really is not your colour! Jealous! Jealous? You really are on crack! There's nothing I could think of that would persuade me to be on the Council again. Especially with the dreadful atmosphere and laid back attitude of so many. Whatever I did, I did with enthusiasm and committment. It is all too common for the current crop of Councillors to see their responsibilities as a chore, hence the clock watching. If only the Councillors did 'do what they are paid for' - haven't you woken up and smelt the coffee that is precisely that they don't that so many in Barnet are really very concerned.